» A Review by Mike Grost: RUFUS KING – Holiday Homicide. A Review by Mike Grost: RUFUS KING – Holiday Homicide. RUFUS KING – Holiday Homicide. Doubleday Crime Club, hardcover, 1940. Paperback reprint: Dell #22, mapback edition, 1943. 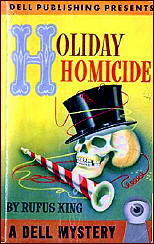 Preceded by Murder Masks Miami (1939) the last Lt. Valcour novel, Rufus King’s Holiday Homicide introduces two new sleuths, high priced private detective Cotton Moon, and his secretary-assistant-narrator, Bert Stanley. The two are direct clones of Nero Wolfe and Archie Goodwin, and the novel as a whole is a pastiche of Rex Stout. Moon is a pleasant character; instead of raising orchids, like Wolfe, he collects rare nuts. The novel might be best read with a copy of Edwin A. Menninger’s Edible Nuts of the World (1977) on hand: a fun book, by the way. This zany hobby is typical of the book’s tongue in cheek approach: nothing is ever completely serious here. King’s pastiche of Archie Godwin is especially good. King has caught Archie’s bemused, intelligent, slightly smart-alecky tone of narration very closely. King has combined this tone with his own vivid writing style, to make a very interesting synthesis. The descriptions include King’s interest in rich concoctions, such as food, perfumes, and fluids. King also uses his typical examination of conventional story telling ideas here, constantly turning over stock phrases and situations, commenting on them all the while — this is an early use of a technique that will reach its apogee in King’s short story “The Faces of Danger” (1960). Since Archie is also a somewhat sardonic observer of the human scene, King can fuse his own meta-narrative approach with Archie’s “common man” take on the well to do world about him. Bert is a bit more bitchy than Archie usually is, in keeping with the campier tone of King’s fiction. While Holiday Homicide is well written, it has problems as a puzzle plot. There is no fair play: Moon identifies the killer because he discovers the killer’s fingerprints at a crime scene. This clue is not shared with the reader, and there is no logical way for the reader to deduce who the killer is. Nor is the mystery’s solution especially clever. It does succeed in making a logical story out of the book’s scramble of events and clues, and this shows a bit of ingenuity. Holiday Homicide has a similar status as Murder by Latitude in King’s career. Both books are 1) genuine whodunits, not suspense novels; 2) lack fair play in their solutions; 3) are well written, with special gifts of prose style and verbal adroitness; 4) show good storytelling.